The Rueful Axe is not a Daedric artifact, while the Masque of Clavicus Vile is. 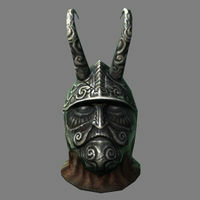 If you wish to obtain the Oblivion Walker Achievement you should exchange the Axe for the Masque of Clavicus Vile during the quest A Daedra's Best Friend. The Masque provides the biggest benefit at vendors of any headgear in the game. This is because both the Barter and Persuasion boosts make prices more favorable. Equipping the Guild Master's Hood will let you equip the Masque of Clavicus Vile, allowing you to benefit from both Fortify Barter enchantments at once. ? † This item cannot be tempered. This issue has been addressed by version 1.0.0 of the Unofficial Skyrim Patch; This enables tempering using an Ebony Ingot and the Daedric Smithing perk. This page was last modified on 29 November 2018, at 16:58.